Frank Giaccio is a hardworking young man. At 11 years-old, he mows the lawn. And he set his sights higher than simply his own or his neighbor’s lawns. He wrote a letter to President Trump asking to mow the White House lawn. And President Trump, being the job creator that he is, welcomed him in to do just that. Frank made some nice straight lines as he mowed the White House lawn while the President looked on approvingly at the ambitious young man. Someday Frank would like to become a Navy SEAL. Frank’s proud dad Greg Giaccio also watched, as the young man was assisted and given guidance by a member of the National Park Service. We don’t know why Obama ignored the young man’s request to mow the White House lawn and just sent a form letter instead. But we do know that President Trump showed this young man respect and no doubt encouraged him and other young people to continue doing their very best. Frank didn’t give up when Obama turned him down. He simply waited for the next President. And Trump did not disappoint him. It is clear that Trump’s priorities are to build people up, not discourage them and ignore them. The economy is roaring. Jobs are returning. Unemployment is at a 16-year low. The stock market is making new records every week. We have a doer, a man who gets things done in the White House now. What a refreshing change. Now if only the Republicans in Congress would stop trying to prevent him from keeping his campaign promises, he’d get even more done. 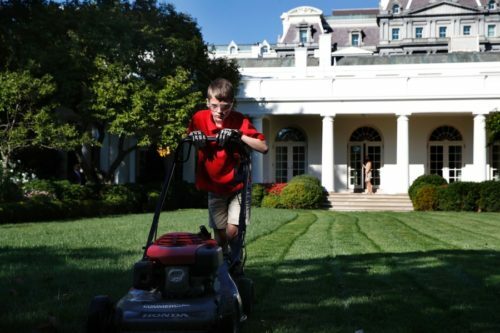 But Congress aside, there’s one happy 11 year-old boy who knows firsthand how generous, upbeat and encouraging our President is, and he will never forget his experience mowing the White House lawn. This kid is going places. Whatever he sets his mind to, he will likely achieve. So here’s to our future Navy SEAL, Frank Giaccio. Your family, your nation and your President are proud of you. Keep up the great work, Frank!